What is a Script Concordance Test? Find out how to create a Script Concordance Test (SCT). If you are not yet familiar with the concept of a Script Concordance Test and would like to know more before getting started, you'll find the necessary information in this article. 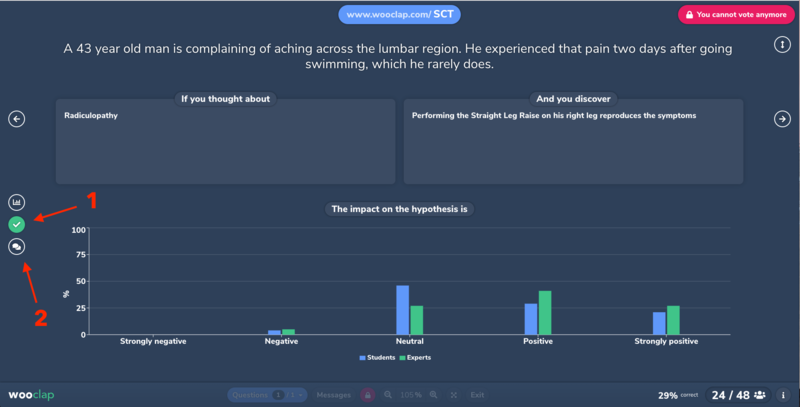 When creating a Script Concordance Test on Wooclap, there are two possibilities: either you have already obtained the opinions of the experts through some other method, or you will collect that data using Wooclap. Fill in the required fields (i.e. the case description, the hypothesis and the additional information), and specify how many experts have selected each answer on the Likert scale. 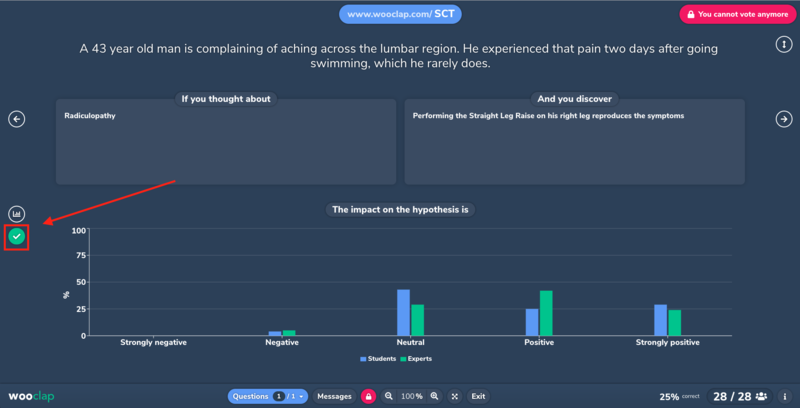 Use the "correct answer" button to display the experts' opinions alongside the students' answers. Unless you are going to ask the experts to answer this question during a live session, create the question in the "Participant pace" tab and fill in the required fields (i.e. the case description, the hypothesis and the additional information). Don't fill in the "Experts' opinion" section! Place your questionnaire online and share your event code with the experts so they can select an answer on the Likert scale and add a short comment to support it. In case you didn't know, the "Import" function can be used not only to import questions from one event into another, but also to import questions from one event's "Votes" tab into its "Participant pace" tab (and vice versa). Go to the "Votes" tab and click on "Import"; choose "Import from another event" (1) and select your current event (2). In the right tab, marked "Questionnaires" (3), select your question (4). Step 4: Ask the students the question in real-time. The question you have imported contains the opinions of the experts. 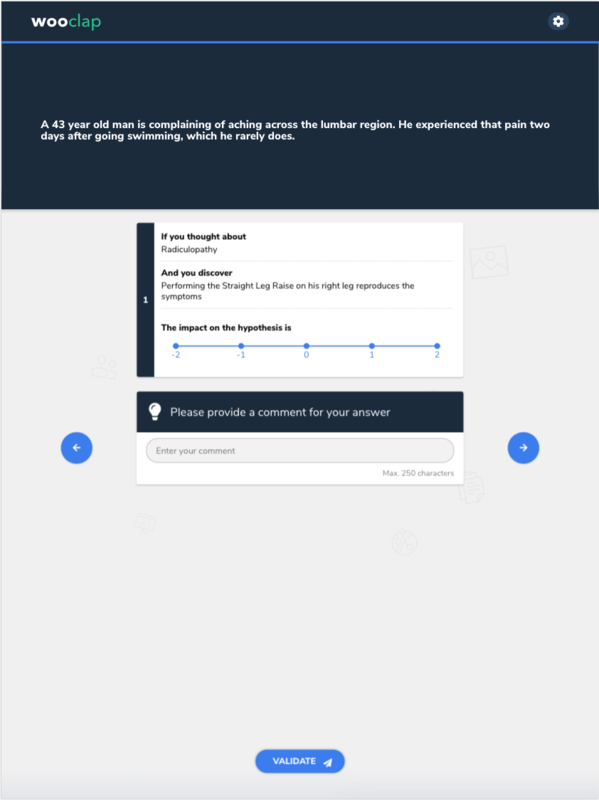 You can compare the students' answers to those of the experts by using the “correct answer” button (1), and you can show the experts' comments by using the button underneath (2). Any thoughts? Share your feedback and suggestions with the team!